"This is my daughter's absolute favorite recipe. It is so quick and easy. Try adding sour cream for an extra kick." In a large skillet over medium high heat, saute the ground beef for 5 to 10 minutes, or until well browned. Drain excess fat. Crumble tortilla chips on a large plate. Layer with the beef, lettuce, tomatoes, cheese, onion and taco sauce. 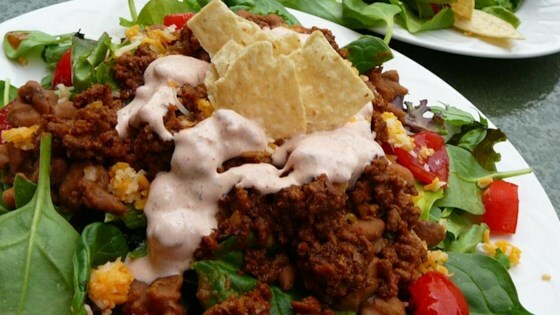 See how to make a delicious taco salad with a twist. really good basic recipe, I added a can of refried beans to the hamburger and a little of the taco sauce. Then layer the rest as suggested. Really good. I added a package of taco seasoning. Also added olives and onions. Makes great super quick dinner. Still makes a mess though. Even better than tacos! I put taco seasoning on the meat, and added kidney beans. I also added a little more taco seasoning to the mix. Wonderful! I used taco seasoning on the ground beef and I used iceburg lettuce. This is always a great meal for our family to use up taco dinner leftovers.